Autotrader uses the Max. Position Limit field on the Position Management window to monitor your position for a given instrument. If Autotrader submits a quote (i.e., normal Bids and Asks, as well as cover orders) that, if filled, would exceed your allowable maximum position, the Position Management window appears with the title: Quote exceeds Maximum Position. Autotrader suspends trading on the side that exceeds the position limit but continues to trade the position-reducing side of the market. Example: If you are short enough contracts to exceed your limit, Autotrader stops submitting offers to the market but continues submitting bids. When your open position dips below the set Max. Position Limit, Autotrader starts submitting offers again. Hedge enough contracts so your Open Positionis less than your Max. Position Limit. Refer to Managing Your Position. Increase your Max. Position Limit so it is greater than your Open Position. Refer to Maximum Position Example. Note: Your Max. Position Limit does not supersede risk parameters set up by your risk administrator. 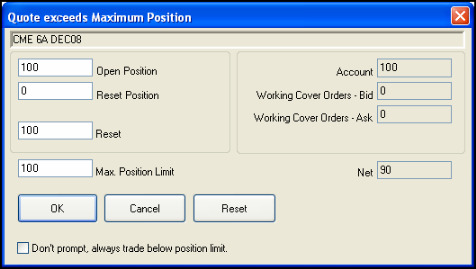 Additionally, the Reset option functions only in regards to your Open Position position in Autotrader, thus allowing you to continue trading.